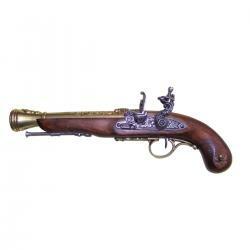 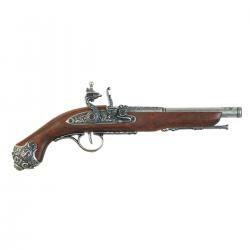 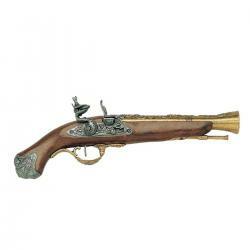 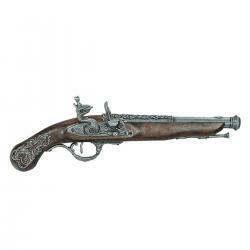 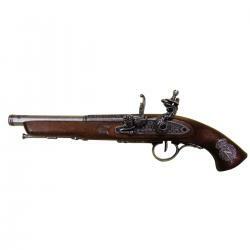 Reproduction of the flintlock pistol manufactured by the craftsman master of Versailles, Boutet in 1810, made of metal and wood with simulated mechanism of loading and firing. The flintlock pistols had the blistering of a flint or flint stone, which when the hammer was triggered, it produced the spark that ignited the gun powder. All these pistols required the manual recharge of their ammunition after each shot. The ammunition, which was introduced through the mouth of the barrel, consisted of gunpowder, projectile and paper wad, which served as a cap to keep the two previous ones compressed inside the barrel. Contrary to the cases of duels with swords, the use of these weapons equaled opponents, since they were in the same conditions when shooting. These duels were developed by the will of one of the parties to wash an insult to his honor. The target was generally not to kill the opponent, but to achieve "satisfaction", for example by restoring one's honor by putting life at extreme to defend it. In many countries, duels were not recognized as a legal way of saving honor, so the duelists used to doing this in secluded places and almost always at dawn. 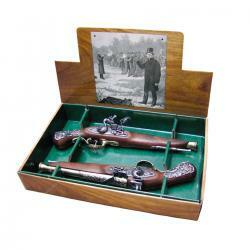 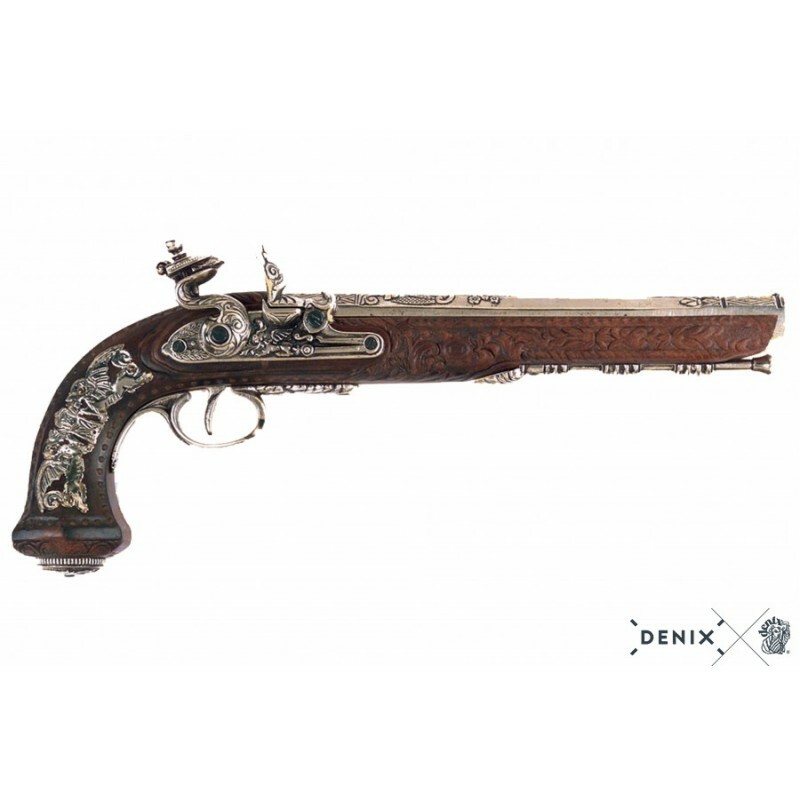 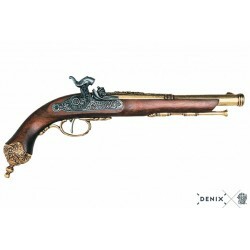 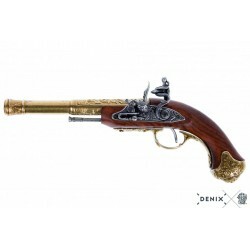 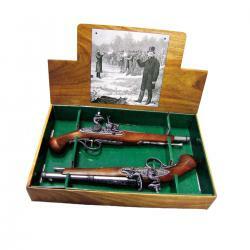 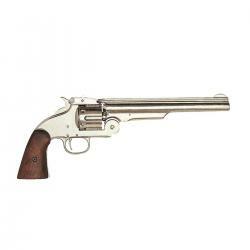 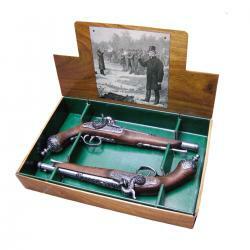 Relive with the historical reproduction of this DENIX pistol the most exciting honor duels! Dimensions: 38 cm / 14,9606"